For some, it's a relief, for others a disappointment, but summer will soon be over. Whether you're looking forward to the crisp fall air or not, there's one thing you should remember to do as summer fades away. Taking good care of your lawn isn't just a summer job. In fact, late summer and early fall are perfect times to spruce up your lawn and get it looking good for the latter half of the year. If you want to help your lawn stay healthy until spring arrives, The Lawnsmith can help you take care of all your late summer and fall lawn care needs. Late August and September are ideal times to get some essential lawn care done. The hottest temperatures have usually been and gone, and cooler temperatures are on their way. Some refreshing rain might be coming, which is good for your lawn and gives it plenty of time to recover from the summer. Your lawn is likely to grow even better now that it's not so warm, so it can benefit from a makeover before fall has truly arrived. There are some top tasks to carry out for fall, and The Lawnsmith can help you with the best schedule. Summer might have been tough on your lawn, with everything from heat to kids playing having an effect on it. If you want to prepare it for fall, there are a few essential maintenance jobs to do. Dethatching is one of our recommended services for fall lawn care. Thatch is the brown layer that builds up between the soil and grass, composed of compressed roots and stems, and decaying organic matter. It doesn't look great, and it can stop your lawn reaching its full luscious green potential. The Lawnsmith can remove this thatch for you and take all the debris away so that your lawn can continue to grow at a healthy pace. Overseeding your lawn is another great thing to do before fall arrives. Overseeding helps you to fill in those patchy bits and balding areas. If your lawn has suffered any damage from the kids playing or an over-enthusiastic four-legged friend, overseeding is ideal to get it sorted and looking pristine again. You might also need to aerate the soil in your lawn. September is a good time to do this, allowing the soil to breathe and spreading cores from the soil over the lawn. This process improves the condition of the soil and helps your grass to grow bigger and stronger for the rest of the season. Get some fertilizing done during this period too, to make sure your lawn has all the nutrients it needs. A layer of fertilizer supports the growth of your grass. 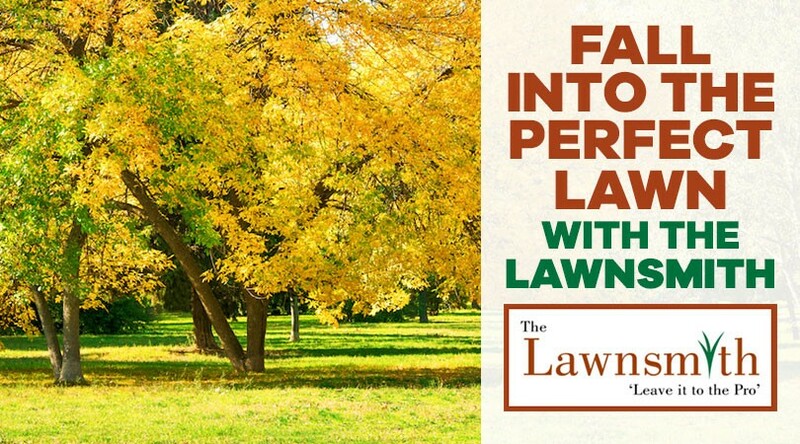 Contact The Lawnsmith to book a free estimate for all your fall lawn care needs. We can create the perfect schedule to help you grow a healthy, green and beautiful lawn.